Hidden under a busy commercial strip in suburban Fresno is an intricate underground labyrinth. 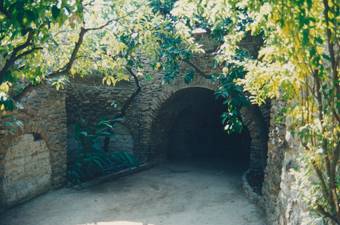 No, it’s not a subway system or natural caverns—it’s the residence and gardens of the late Baldasare Forestiere. 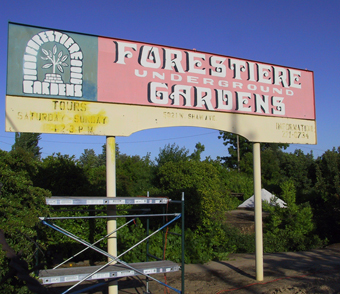 Forestiere, a Sicilian immigrant who came to the San Joaquin Valley in 1905, was a cultivator of trees and vines who envisioned citrus groves on his property. Upon finding, however, that his newly-purchased land was hostile to agriculture, Forestiere decided he would simply take his dream underground. Chiseling through hardpan rock with hand tools, Forestiere carved out a subterranean compound comprised of intricate passageways, patios, courtyards, and rooms. Lit from above by skylights blocked from rain by enormous planters, the “gardens” consist of corridors lined with peepholes and alcoves, full of grape vines and trees heavy with fruit in the growing season. The vegetation—and the inhabitants—are protected from both heat and frost by virtue of being underground, and excess rainwater drips into elaborate sand “sump pits” from the sloped passageway floors, so flooding is never a problem. Forestiere designed the passageways’ width and curvature specifically to modulate the air flowing through them, creating an intricate underground ventilation system. His home was complete with a kitchen, a library, two bedrooms, a living room, a bathroom, a fishpond, and an aquarium—and in all, the rooms in the gardens number almost 100. A variety of trees—from jujube, pomegranate, mulberry, date, and palm to all manner of citrus—abound, many the products of grafting done by Forestiere resulting in single trees that bear many types of fruit. Hailed as a visionary engineer and architect as well as a skilled horticulturist, Forestiere built and cared for his underground home—where he resided fulltime—for forty years. He died in 1946, and the gardens were named a registered historic landmark in 1979. Today, the gardens are open to the public, maintained as a museum by Forestiere’s niece, nephew, and great-nephew, Lorraine, Ricardo, and Andre Forestiere.